Every Business Owner Will Exit Their Business... One Day! Are you prepared to do it on your terms? Most business owners have never exited their business before. Straight Talk offers compelling reasons to begin succession planning long before you need it and introduces readers to The Donnelly Method, a four-phased approach to ensure the leadership side of your succession and exit delivers the outcomes you want. Learn the critical steps to prepare your successors to run your business profitably and sustainably, whether you plan for them to own it or you choose to sell it to a third party. Discover the road blocks and barriers that can derail your best intentions. 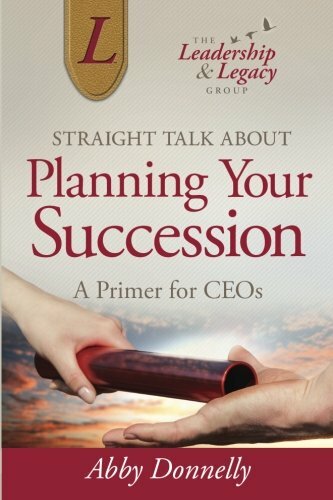 Straight Talk About Planning Your Succession should be on the must-read list for any business owner. Most of the information on succession planning focuses on the financial aspects and ignores the behavioral or emotional hurdles – which can be the most difficult. I applaud Abby for giving business owners a roadmap for navigating these challenges. Straight Talk is the perfect book for owners of small to medium size businesses who want to make the perfect exit. The Donnelly Method for Succession and Exit is a special, tried and true process to ensure a smooth and successful exit. It is very easy to read and implement. Considering all the effort you’ve put into your business, this book will help you get everything out of it and more! Abby Donnelly has written a must-read primer for anyone considering selling or transitioning a business. This book has practical, no-nonsense advice that every business owner should consume and master. Straight Talk! serves as a compelling, natural transition for the next step of ownership…when it’s time to gracefully and productively exit with purpose. Whether your exit is in five years or ten, planting the seed in your head now and following Abby’s guidelines will help it feel less like an upheaval and more like the healthy, natural progression it should be. — M. Steve Cavanaugh, Jr., P.E. – President & CEO at Cavanaugh & Associates, P.A. Straight Talk! takes succession planning from “I will think about this someday” – to — “I need to start planning now in order to do this right”. Abby has spelled out the many struggles that come with exit planning, and provides the critical reasons to not delay. As a CPA and a Certified Valuation Analyst that has consulted on over 100 effective business successions, I have seen firsthand the success business owners have when they plan well — and the trials they go through when they don’t. If you want to maximize the effectiveness of your exit, take a cue from the pages of Straight Talk!